Some of you have wondered about my MIA over the last couple of days and my arguably puzzling silence while being at the center of the action at CTIA in San Francisco where our long-awaited Treo 650 was officially released on Monday. 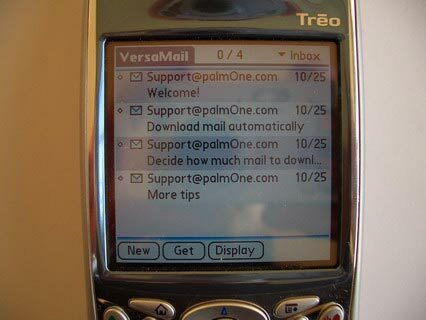 The answer is that I have been gathering as much information as possible from people at palmOne and PalmSource as well as other attendees and spent a lot of time absorbing this, thinking and slowly formulating my own opinion as to whether the Treo 650 was just OK, great or fantastic. On Monday morning I woke up in a foul mood after the press release announcing that the Treo 650 would only have 32MB of memory, that the camera was not the anticipated 1.2 megapixels and the rumour (later unfounded) that the Bluetooth might have been crippled by Sprint. It was all painfully disappointing - so very close to perfection... Little happened early that day at CTIA to lift my spirits but later I finally had the opportunity to play with a Treo 650 on my own for over an hour and this considerably swayed my mood back upwards and prompted me to rapidly write my last post. I am glad to report that my wish has now been granted and that I've had a chance to play with it for many, many hours... so here is my honest and final take on the Treo 650. Thus yes, power users like myself and many of you will have to continue using a launcher or PowerRun to install our spillover applications on an SD card but within the greater scheme of things this is but a minor inconvenience. As for the camera, I like many carry a high-end 4.0 megapixels one with me pretty much at all times and my Treo would never be a replacement for it. Like the mini Polaroid camera which takes stamp size pictures for the fun of the moment the camera on the Treo 650 should be seen as a complementary feature for specific uses (palmOne has built one such use in its improved Contacts application for example). Now that I've gotten these sticky issues out of the way (and out of my system) let me take you through both the new and improved hardware and software features that in my opinion combine to make the Treo 650 the absolute best smart phone on the planet (now leaving our Treo 600 as the second best one...). While I would naturally have preferred the antenna to be built-in to the phone the T650 sports one that is smaller than that of the T600. My understanding from speaking with various people at palmOne is that there were design constraints within the need to deliver quad-band capabilities which we'll all agree is considerably more important. 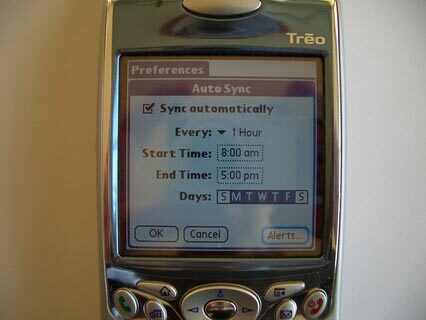 As always this is as simple as sliding the button to On or Off mode and is identical in shape to that found on the Treo 600. Finally you can insert the card facing up as would seem 'logical' to most Treonauts. Remove, insert SIM card and you're ready to go. 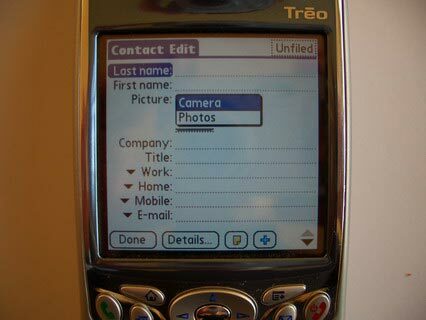 One of the most contentious issues on the Treo 650 has been that it does not sport a higher resolution camera. While this is true I can say that while the resolution may be the same the one on the Treo 650 is significantly better than that found in our current Treo 600. Aided by the higher resolution screen, a 2X digital zoom and a much more intuitive interface this feels like a completely new camera. A smart looking grey stylus crafted in one piece is in my view a significantly much smarter presentation than the T600 stylus with its 3 piece structure and the relative annoyance of having to unscrew it in order to reset the phone. Now the tip of the stylus can be used directly to fit the reset slot. While I personally never found myself in a situation that required more juice than the T600 could deliver in one fully charged stretch it is obvious that many other Treonauts will welcome the convenience of carrying multiple batteries over long travel or active usage conditions. A slightly redesigned volume button works as well as the previous one. While rumours had previously circulated that this additional side button was intended for push-to-talk functionality it is in fact a customizable button that will bring up any preselected application when you hold it for a few seconds. It is my understanding that the button comes factory-mapped to the RealPlayer for MP3 playback. The phone speaker has been upgraded to provide better audio quality for your calls. 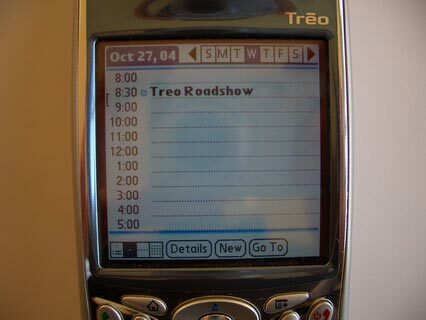 It is without a doubt that the brilliant 65,536 colors TFT display on the Treo 650 is absolutely stunning and has no point of comparison to the Treo 600's low-res 3,375 colors. As I've noted previously, even the smallest details can be clearly seen without straining your eyesight. 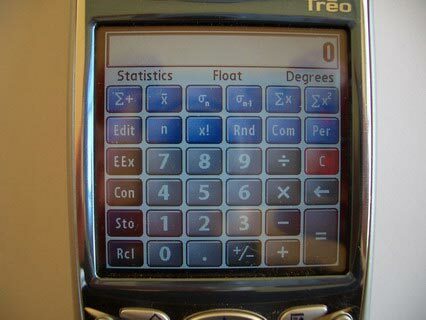 The display alone significantly increases the feeling that the Treo 650 is a more 'robust' unit than its sibling. Aside from a change of location on the phone the apps button performs exactly as before. 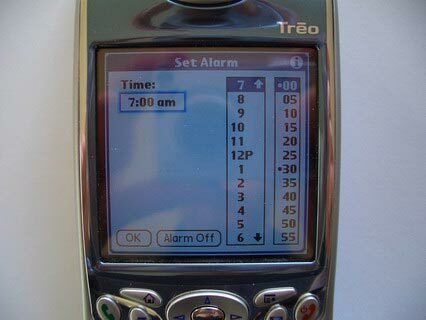 You can 'wake' the Treo 650 by pressing this key and it will open the 'phone' app as before. Pressing it a second time will bring up the 'call log' which was previously done by the center nav button. Again, the function of the button has not changed but the calendar application itself has improved (more in Software below). This was perhaps the button that took the most getting used to but once you've memorized its new location you realize that from a usability perspective it is much improved. 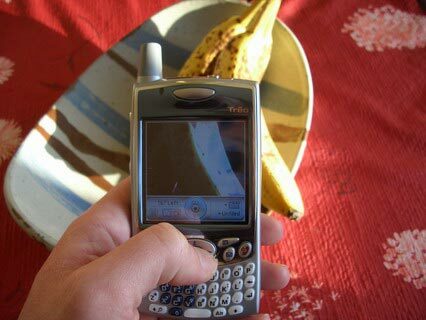 Trust me when I say that the previous Power button is not at all missed on the Treo 650. The new one which also serves as the call end button works perfectly well and pressing it for a few seconds will connect or disconnect your carrier session. Exactly the same function as before with the ability to map a primary and secondary application to the button. 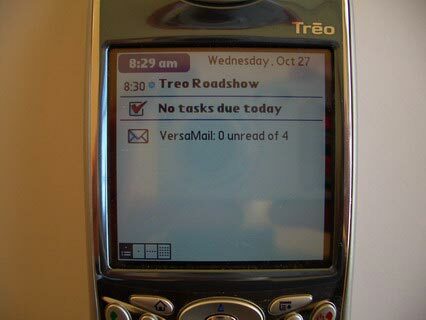 The nav button feels slightly more responsive on the Treo 650 but aside from this it retains the same functionality as on the T600. The new keyboard is absolutely fantastic (an understatement). The slightly larger keys and minor shape change as well as the flattenning of the keys and a better 'press' responsiveness combine to deliver an extraordinary improvement over the T600 keyboard. I don't think that I am exagerating if I state that I felt my typing ability to have improved by at least 20% on the Treo 650 keyboard. This remains located in the same place but with the keyboard improvements it is now much easier to dial the numbers quickly and without input errors which I experienced occasionally with my T600. I am now resigned to stop complaining about the 2.5mm jack issue. 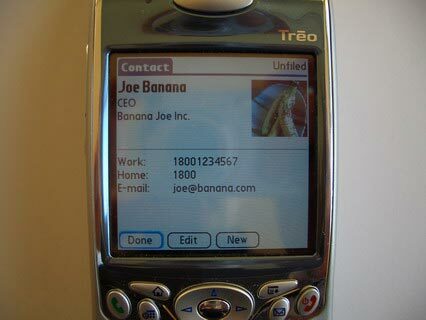 The Treo 650 is a phone and 2.5mm is standard in the phone industry so this is what would seem logical to implement. As I've written before I've had a 2.5mm headset for a while on my T600 and I'm very happy that this will be one of the accessories that I'll be able to reuse on the T650. 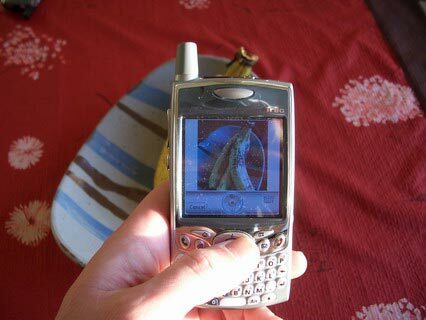 To my astonishment I discovered that the tiny opening at the bottom back of my Treo 600 was in fact the microphone! 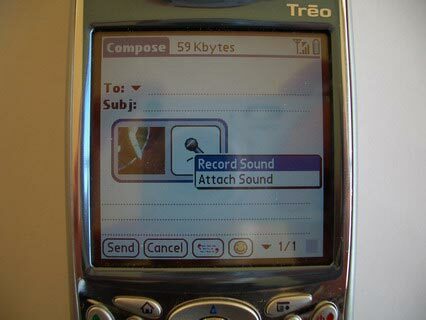 The microphone on the Treo 650 is therefore not a new addition but a repositioning to the front where it will be less prone to pick up peripheral noise. I am by no means an audio expert but to my normal ears the new speaker on the Treo 650 sounds clearer and louder than on my current Treo 600. 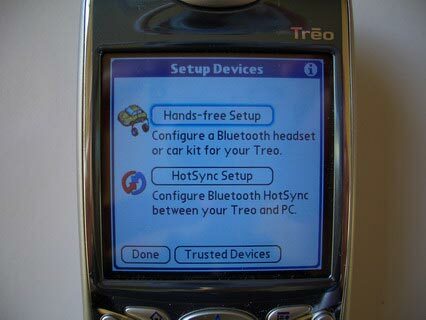 Among all of these hardware features it is evident that the enhanced screen and keyboard, removable battery as well as the repositioned buttons are not only the most important improvements but combined also deliver a completely different experience to that of the Treo 600. Furthermore, the build quality on the Treo 650 is leagues ahead of the Treo 600 as the many mistakes and issues found in this generation have been corrected. Overall the Treo 650 feels like a grown-up version of the Treo 600 - slightly wiser and more robust. 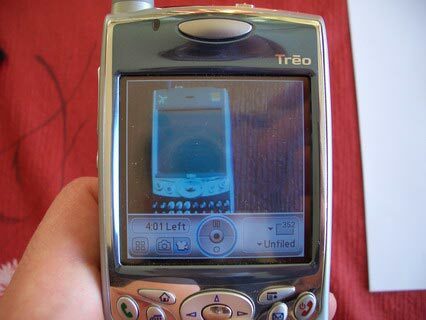 You could say that the Treo 650 is an evolution revolution. 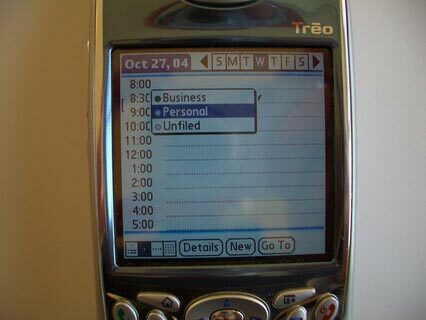 A redesigned and enhanced home Phone screen provides information on three top lines with an 'unread email notice' (not shown) appearing to the left of the time and a 'next appointment' appearing below the time. The bottom line below the dial pad provides access to the customizable favorites menu. Users can also select to replace the dial pad display with any picture on their phone or SD card. Alternatively you can also choose to fill the screen with seven lines of favorites. 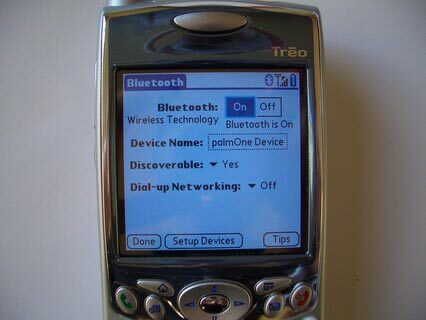 Never having had the opportunity to use a Bluetooth device before I was very curious to see just how easy or complicated it might be to setup a BT headset on the Treo 650. Here it was simply a matter of clicking Setup Devices. Next there is a two step Hands-free Setup which took barely a couple of minutes to complete. Here my test Jabra 250 headset has been successfully paired to the Treo 650 without any problems at all. On the top right hand corner you'll notice that the BT icon has changed to display a small headset indicating that my Bluetooth is active and that the audio portion of the calls is now being relayed to my Jabra headset. As I mentioned earlier a simple use for the camera has been incorporated into Contacts. You can add a picture taken with the camera or any photo on the phone and 'map' it to your contacts. Is this case I am in the home of Joe Banana so I snap a picture of one of his products (the picture taken is automatically cropped in a square format). A reference picture for Joe Banana is now mapped to his contact. Joe Banana's complete details with picture. 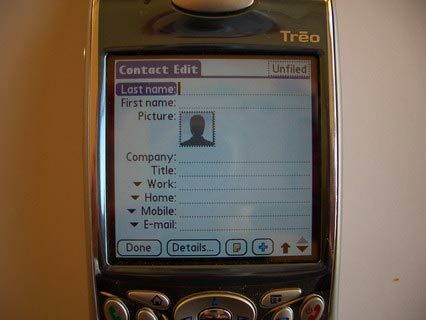 Should JB call my Treo 650 his picture will automatically pop-up on the screen. Enhanced by the ability to select multiple user-defined categories for each appointment. A new aggregate daily view which provides you with a complete list of appointments, tasks and emails for a given day. 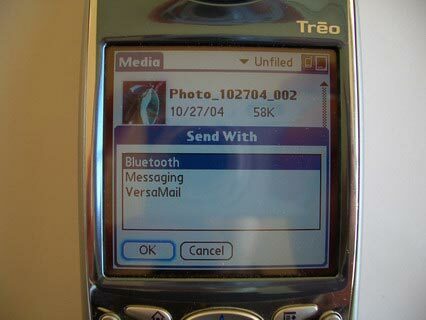 As we'll all agree, eMail is probably the single most important feature that Treonauts are looking at on the Treo 650. VersaMail has been completely revamped and now supports up to 8 email accounts on POP, IMAP and MS Exchange Server. While VersaMail does not support 'push' in the traditional sense you can however set your email to sync automatically on a periodic basis from every 5 minutes to hours and schedule this for different times of day and days of the week as well as to set alerts whenever a new email is received. To be honest with you I consider this to be more than enough for my purposes but as previously reported there are also a number of other solutions provided by third-parties such as Good Technologies and soon BlackBerry that will provide mobile professionals the choice to fit their particular needs. Having to date considered the messaging app on my Treo 600 to be the very best in the world I didn't immediately expect that this could become even better. Aside from keeping all of your SMS messages in the now familiar thread format you are now able to make use of MMS by taking/attaching pictures and sound at the simple press of a button. The camera interface has been completely revamped and is now not only more intuitive to use but also feels like a quality modern camera as opposed to the toy-like feel of the T600. Naturally the higher resolution screen helps enormously to add value to the camera. There is now also a 2X digital zoom which is useful if you're looking to take product close-ups for example. It's perhaps difficult to judge from this picture alone but the image quality and resolution of the picture taken on the T650 is significantly higher than that on the T600. 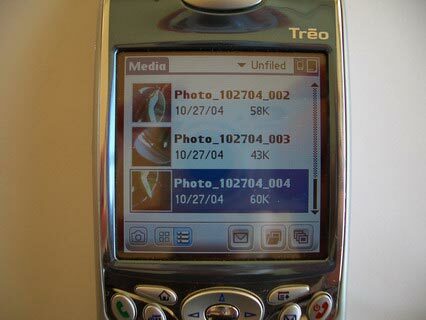 The Treo 650 now supports video via the same interface as the camera. You can see the Camera and Camcorder icons to the left of the center navigation button on the screen. I found it useful not to have to switch or launch yet another application to use either. 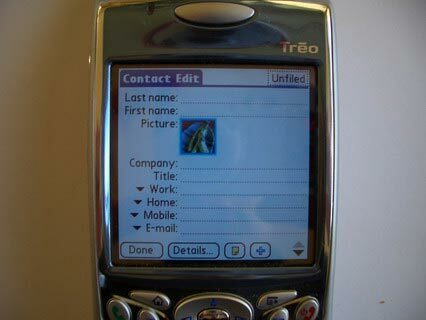 The new Media application on the Treo 650 allows you fast access to your photos and videos both on the phone and SD card. You have different view options as well as a slide show with the single press of the bottom right button on the screen. There are many other functions such as the ability to add a voice memo to each of the pictures which I find extremely neat. One of the great things that I found was the ability to rapidly select any media to send via either BT, SMS or eMail. Blazer 4.0 on the Treo 650 not only delivers such a superior experience thanks to the higher screen resolution but is now also much easier to use thanks to full 5-way navigation button support. To many it will also immediately feel much faster as the browser rapidly downloads text first and images only later. I could not test it on EDGE but it is obvious that browsing on a faster network should make the entire experience even smoother. The main improvement on the Tasks front is that you now have the ability to sort more easily as well as to view pending tasks by date thanks to easily accessible tabs at the top of the screen. I can't imagine anyone not finding a practical use for such a complete calculator and now that the interface has been completely revamped it also makes for a considerably more enjoyable experience. The familiar WorldClock but now with the addition of a built-in alarm clock. I had been clamoring for such a simplified alarm ever since switching from my Nokia where I used one regularly and I'm glad that I'll now finally be able to set wake-up alarms on my Treo 650 with but two clicks and without using a stylus. Considering that the Treo 600 was already the best smart phone in the world, that no other contender comes even close to matching the overall capabilities, flexibility and usability of either the Treo 600 or 650 there really can be no other logical conclusion than that the Treo 650 is now the very best - perhaps even the only real - smart phone on the planet. i am bursting with impatience at having mine! Can you place a background picture in the agenda view? How about the main launcher view? Thanks for the nice review. I especially appreciate you running through the software changes for us. Since you were able to mate your Jabra BT headset -- do you know if there is built-in or 3rd party voice dialing functionality available? 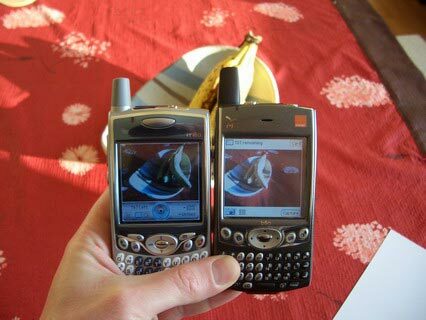 Why doesn't anyone post comparitive pictures TAKEN with both the Treo 600 and the 650. The comparitive screen shots don't cut it for comparing the camera, only the actual pictures will. 1. is there voice recognition for dialing? 2. is there a voice memo app? I am interested in whether or not you can plug in a wifi card into the SDIO slot. Does it work? Great overview - too bad the rest of us will have to wait until January at the earlies to get our hands on a non-Sprint phone. The 650 will take video but will it play video? I'm talking full screen, full motion, 25-30 fps with stereo. Question: I'm going to start traveling to Europe in 2005. Am I better of with the CDMA or GSM version? Would you recommend a carrier for best coverage both in US and Europe? 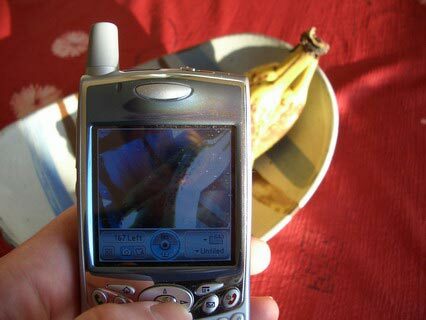 You must have a GSM phone to use anywhere else in the world. I am an outlook user that syncs a large number of contacts to my Treo. My question is this: has the contacts app been revamped to support a decent number of fields out of the box? This enhancement is long overdue for these devices. You should not need to purchase a third party app to "fix" this. What are the CPU's and speeds used in the 600 and the 650. Are they the same? Ref Jonathan Greene 28Oct 08:43 pm. Check out www.mmplayer.com for Mobile Media Player. 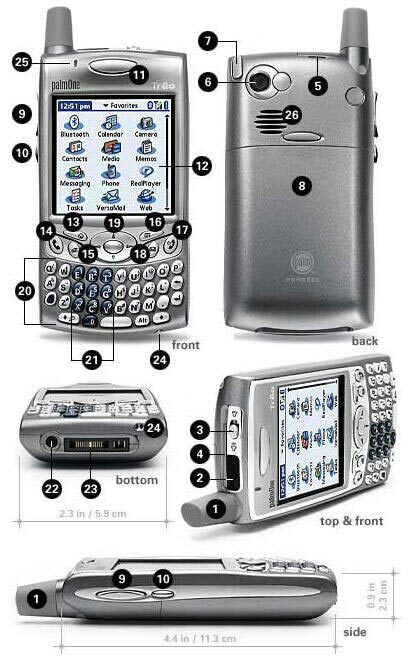 I use it for movies -- 90 mins cramps down to about 85 MB's -- on my Treo 600. Why couldn't it have more memory? Palm claims that it's to keep the cost down, but how much can another 32 or 64 MB cost?? And if memory is so expensive, how do they manage to sell iPaq's with so much memory for the same price (or less) than Palm devices??? One question, can you dial a telephone number from within a calendar entry, e.g. a conference call number? You couldn't on the 600 without a purchased app. Can the 650 do this seemingly intuitive thing? Also applies to launching to a URL from within an entry and also creating and addressing a new email from an entry. 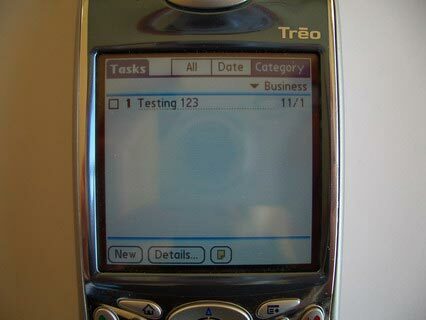 Will the software improvements be usable on my treo 600 , before I decide to buy the 650 ??? Have you tested the infrared port for distance? The 600 port could only go about 2 or 3 feet. If you were looking to control a TV you need considerably longer distance. Great Review. Fair and complete. Now can you do a fair and complete one with the question on al our minds Treo 650 vs PDA2K thanks! Very detailed review indeed. Thanks. You got to be a great friend to everybody as you seem to see the goods magnified and the bads diminished. 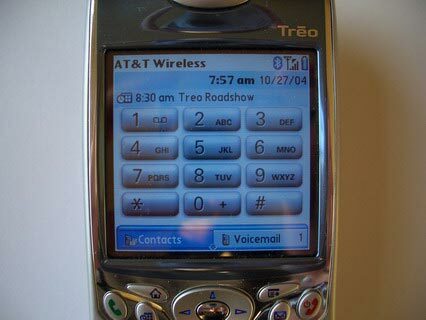 Just my personal opinion -- Treo 650 is far from "the best". Sorry.. just have to get my disappointment off. Excellent review Treonauts! 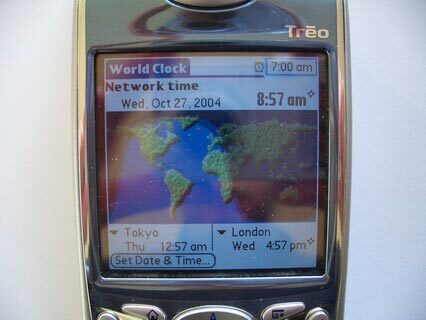 I currently have a Treo 600 and love it. 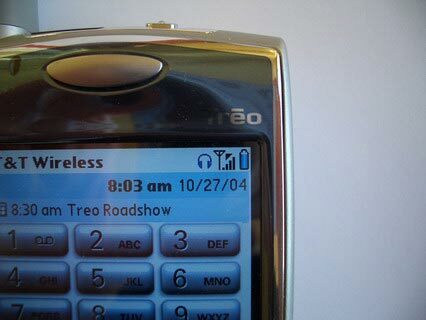 I can't wait to try the Treo 650. 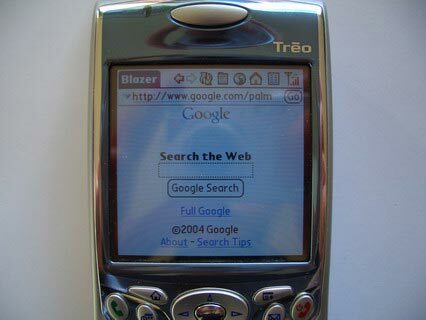 I still believe Palm makes the best all around PDAs, although the Pocket PC and Blackberry PDAs are closing in quickly. Keep up the good work. With regard to your wish list, maybe someone at PalmOne is listening. Do you enjoy visiting Treonauts? We started this blog a little while ago with the intention to create a definitive Treo product guide and came up with a new term that we thought wrapped this concept up. We named it a 'bloguide'. 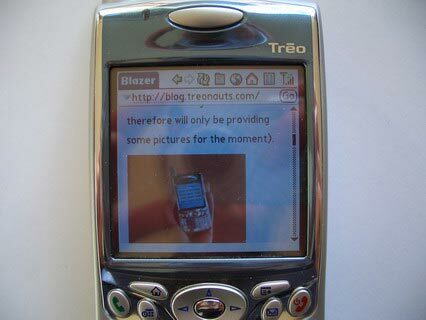 Since then, the Treonauts bloguide has become one of the leading and most influential destinations for existing and prospective Treo smartphone owners (now nicknamed "Treonauts") with over 300,000 visitors per month.